We carry out our work in this area through the three strategies below. Our associates and customers around the world contribute their time, expertise and money to Walmart-supported initiatives, such as hunger relief and disaster relief, as well as to a range of causes about which they are personally passionate, such as education and healthcare. Encouraging associate volunteerism in the U.S. Volunteerism Always Pays (VAP), a Walmart U.S. program, provides associates the opportunity to raise money for eligible charities in the form of Walmart donations simply by volunteering at least 25 hours each year. In FY2018, through the VAP program, over 50,000 full- and part-time associates volunteered more than 850,000 hours, generating over $8.5 million in Walmart donations. Sharing our skills. In FY2018, Walmart continued to expand programs to enhance skills-based volunteerism, in which associates with a particular expertise are matched with charities that need them. In one instance, a group of Walmart senior directors used their skills in strategy, planning and execution to collaborate with the Regional Food Bank of Oklahoma City to help refine the nonprofit’s processes and improve their level of service to their clients. In FY2018, through the VAP program, over 50,000 full- and part-time associates volunteered more than 850,000 hours, generating over $8.5 million in Walmart donations. In 2017, Walmart associate Adam Holland joined six other senior directors from across Walmart to assist The Regional Food Bank of Oklahoma in Oklahoma City for two weeks. Their goal? To help refine the nonprofit’s process and take its services to the next level in addressing hunger. The group was part of Walmart’s BRIDGE program, a program where associates use their expertise to increase efficiencies in order to strengthen operations for nonprofits. Before leaving for Oklahoma, the group defined their mission and what they hoped to deliver for the Food Bank. Once on site, they spent several days meeting with executives, touring the facilities and visiting some of the local food pantries served by the Regional Food Bank. The Walmart group used the information they gathered from their tours and interviews to develop a draft framework for scaling the network of pantries. Katie Fitzgerald, CEO of the Regional Food Bank of Oklahoma, says the Walmart team helped them meet and exceed their ultimate goal. “It would have taken us months to get to where we got to with this team in a matter of a couple weeks’ time,” said Fitzgerald. The BRIDGE program experience was equally impactful for the Walmart volunteers. “I am humbled by what I have seen today,” said Adam. “I’m proud of the company I work for, which not only allows me this time to volunteer, but also supports the Food Banks’ efforts on the front lines!” The Food Bank, which serves 53 counties in Oklahoma, delivered 52.2 million pounds of food from July 2016 to June 2017, including million pounds from Walmart. The Food Bank also assists senior citizens and children. Last year they helped feed over 44,000 kids with its Food for Kids programs. Our associates at Walmart Argentina Home Office, dedicated 1,176 volunteer hours to 14 service projects. For Christmas, Home Office associates teamed up to provide more than 50 families with Christmas dinners and gifts. 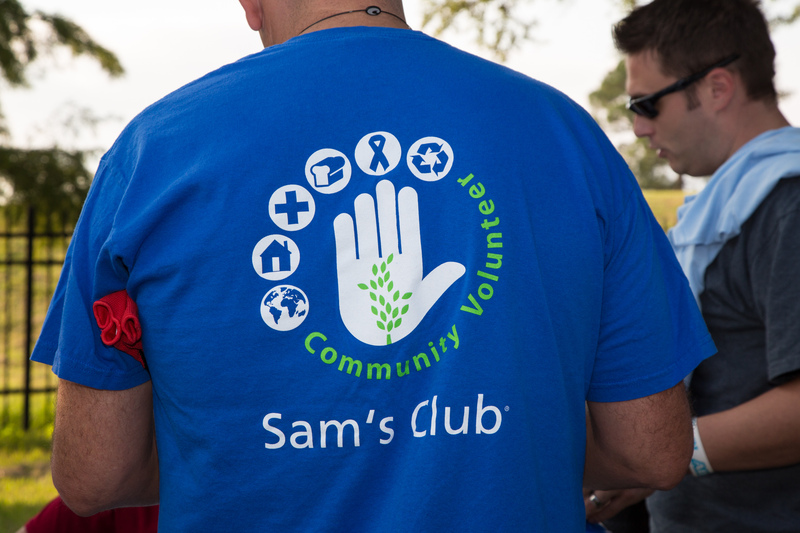 Walmart and Sam’s Club associates in the U.S. and Canada continued their support for Children’s Miracle Network Hospitals (CMNH) through a fundraising campaign that ran in stores and clubs. CMNH reports that it raised over $60 million in cash and in-kind gifts through this campaign in 2017, in addition to grants from Walmart and the Walmart Foundation. CMNH reports that over the past 30 years, Walmart, the Walmart Foundation, associates, customers, and members have contributed almost $1 billion. One of the Asda Giving Strategy priorities is to support women’s breast health. Asda Tickled Pink, working in partnership with Breast Cancer Now and Breast Cancer Care, is helping to provide lifesaving research and life changing support to anyone affected by breast cancer. Asda has supported the two Tickled Pink beneficiary charities—Breast Cancer Care and Breast Cancer Now—for 21 years, raising over $68 million USD to date through customer, colleague and supplier support.